Home/Blog Posts/How Is Impatience Keeping You Single? 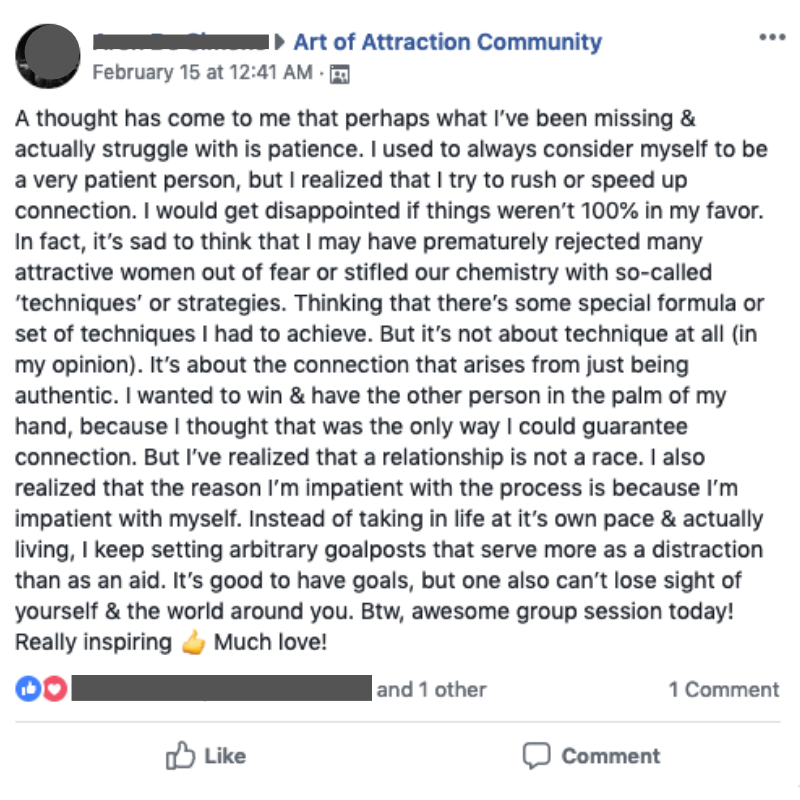 The other day I received a message in my Art of Attraction Facebook group that’s exclusively for current clients. In it, a client of mine revealed a revelation he’d had from one of our powerful coaching calls around impatience and how it was keeping him single. And I asked him if I could share it with you because often, the ways in which we keep ourselves single are NOT what we think they are. And that makes sense, right? If the answer were obvious you would have thought of it by now – identified the issue and fixed it! And you wouldn’t be here reading about how to do just that. THAT is the gold. That shows an underlying self worth issue so deep it didn’t even take the front seat in this post here. But you can see how such an assumption – that a woman wouldn’t even be interested in connecting with him unless he had the right techniques, said the right things – basically if things were 100% in his favor. That’s a lot of pressure!! So much so, that he would get impatient, rush to avoid the discomfort, and end up psyching himself out and losing her – thus keeping himself single. I help people figure this kind of thing out and solve it in a matter of weeks. Permanently. Are you ready to breakthrough this and meet the woman you’ve been seeking? Click here to schedule a free call with me, and let’s see how I can help.